You’re finally doing it. You’ve decided to start your own business, become your own boss, and break out of the daily grind. But then reality sets in – you have no money to help get your business off the ground. In any business, money is everything. You want to be prepared for unexpected expenses, issues with getting paid by customers, and anything else that might affect your cash flow. 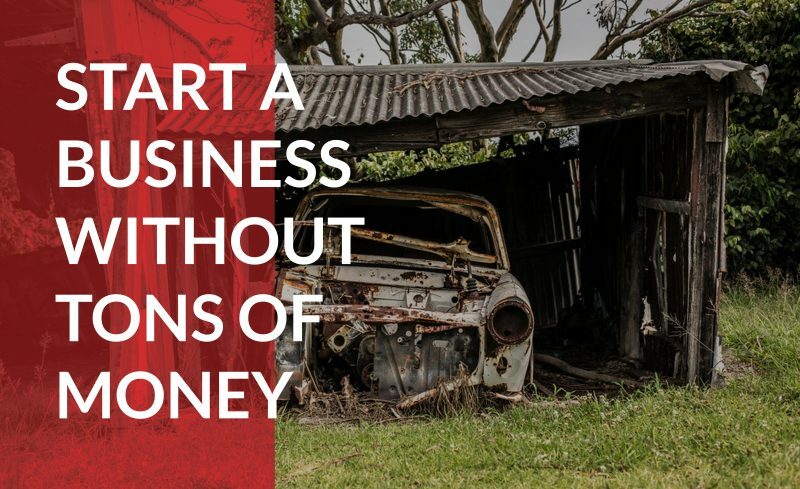 Starting a business with no money isn’t easy, and you’ll face some pretty large challenges as you work your way to success, but it is possible. Here are some ways to turn your big idea into your dream job. You may want to throw caution to the wind, and throw yourself into your true passion, but great things come to those who are patient. The most important thing you can do right now is keep your job. Even though it may not be the most impactful role you could see yourself in, what it does offer is a steady source of business capital. You can even start a side hustle. Using aspects of your developing business as a side job can help you network with all the right people, and make connections in your new industry. If you don’t have a job and you’re considering starting a business with your new free time, bump up getting a new job to the first item on your business checklist. Is a conventional career not for you? That’s fine. Look into getting a flexible role, or a remote position, instead. When starting your business, one way to ensure success, and help avoid burnout, is to build your business around the skills, interests, and knowledge you already have. This could be anything people buy, from handmade crafts, to pet sitting, fitness coaching, or even big-ticket items like building custom computers, or restoring vintage cars. Going into business in the same industry as your day job gives you a leg up, since you most likely already know many of the ins and outs of the business. Until your business takes off, it’s wise to figure out where you might be able to save some cash and do most of the tasks yourself. Do you need to build a website? Do you need product photography? Do you need to actually make physical items and build up inventory? While some of these are short-term time investments, remember to budget time and money for other tasks like bookkeeping, taxes, customer support, and anything else that may become a consistent need for your business. If you were unsure about the need to build a website for your new business, the answer is that you absolutely do need one. Take the time to build a website, but also to create social media channels for your brand. Take advantage of free stock photography from websites like Unsplash or Pixabay. If you need product photography, it’s possible to replicate studio-quality product photography with minimal investment using the smartphone you already own. You can also find free photo-editing products, such as GIMP, which helps you get your products ready to sell.When you’re working with a tight business budget, every penny counts. If you’re starting a business, think about who you already know who can help you get the word out. Reach out to your friends, family, and even social media and networking groups. Remember to do this in a mindful, considerate way – your new business’ reputation now depends on it. You want your social network to be just as excited and positive about your business as you. Don’t pressure anyone to spend their precious time or cash unless there’s a valuable return for them. Your networking ability is your most powerful asset at this juncture of your business, especially if you’re targeting local customers. Be kind to them. This is your opportunity to get free feedback as well, such as if a product you created wore out too quickly, didn’t operate as expected, or had issues with shipping. Your social connections are more likely to be gentler about these issues since they know you, and they’re doing you a huge favor by letting you know about these problems so you can correct them. Speaking of your social network, if you don’t already have social media, now’s the time to take the plunge. Create profiles on the top five sites: Facebook, Instagram, Twitter, LinkedIn, and Youtube. Social media allows you to control the image of your business, advertise new products, and engage with existing or potential customers. These sites also come in handy when it’s time to invest in paid social media. While it’s important to sell products and services on your own website, small business owners can also benefit from selling on Etsy, Amazon, Craigslist, or in local or interest-based Facebook sale groups. Once you have some visibility, marketing materials, and business cards, it’s time to network with other local businesses and see where you might be able to make some connections or referrals for free. If you’re opening a bed and breakfast, see if there are souvenir or gift shops in your area, and ask to leave some brochures. If you’re offering fitness classes, consider where people who are looking to get fit might shop – this could be as simple as leaving your card or flyer on a bulletin board at your local health-oriented grocery store. Try to figure out where your target customers might go before, or after, they make a purchase from you. You can also work with local media, business organizations, or community events. Do you know the essential costs for your business? It may be more (or less) than you think. Now that you have a solid plan for your business, you need to figure out the running costs required to maintain your business. As a small business owner, you may be able to write off expenses at tax time, but you’ll still need to be prepared to pay them upfront. This may also change as your business plans change – if you started as a personal trainer traveling to the homes of your clients, but now want to channel your passion into starting a gym, you need a physical space. If your products are selling online, you don’t need a storefront – unless all your customers are local, or you live in an area that’s popular with tourists. As you ramp up your business, the cost of equipment, tools, or materials grows too. See where you can rent these items, buy them used at a steep discount, or buy them wholesale. Lean into your network of friendly business to learn ways to save money. Budgeting tip: If that sounds like a whole lot of math that you’re completely unprepared for, check out this free course in Accounting created by the U.S. Small Business Administration. If you need to generate cash flow quickly, focus on selling items or services with a high return on investment (ROI). This means your investment in the product is minimum, but the revenue you receive from each sale is maximized. Doing this might be harder in some businesses, but almost all businesses can find something to offer at a high ROI. For example, bath bombs for your spa business, or a fitness guide for your gym, can both be created quickly, but sold over and over again. Apps are another example, as digital items can be a huge source of revenue. If you create your own products, see if you can find materials of equal quality that are available in bulk, or research other ways to swap out your monetary investment for a time investment. A baker might make their own custom sprinkles, a gym owner might paint their own location, or an accountant might prepare their own spreadsheets and formulas. These are also examples of using what you know to help build your business. There’s no reason to scale up quickly. unless you’re committed and are ready for it to work. If these tips have helped your business grow at a steady clip, it may be best to keep a bootstrap mindest, using revenue to grow your business, rather than an outside investment. Still, sometimes you need capital to reach the next phase in your business growth. You determine the metrics of your success, but some small businesses do have the potential to become big, and for that to happen your business needs to keep growing. At a certain point, it may become clear that your business can’t possibly grow without an influx of cash. If you want to jumpstart your business, and you’re ready to take the risk, it might be time to consider getting a small business loan. Before approaching a bank or lender, make sure to read reviews from other business owners who have worked with them. This should also be your last option. First, you need to have a solid business plan, a steady customer base, and steady revenue. Then you have a shot at getting approved for that loan. If you want to avoid a loan, consider approaching potential investors, or borrowing the money from your own savings. Your family may have seen the potential of your business, and may want to contribute to help you get to the next level. Be cautious. Loans, and dipping into savings, whether you own or your family’s, comes with a risk. Be careful not to overextend your business. Did you know that some of the most wildly successful businesses went through the exact same growing pains your business is experiencing? Whole Foods, Nike, Apple, and Disney are some of the most well-known companies with small business roots. The founders of Whole Foods, John Mackey and Rene Lawson, actually lived in their first store when times were tough. Their seed money came from friends and relatives. In 2017, Amazon acquired Whole Foods for $13.7 billion. The founders of Nike, Philip Knight and Bill Bowerman, started out by selling shoes from the trunk of their car. Today, Nike’s net worth is $126.4 billion. Disney was started in a garage. Today, Disney’s net worth is over $110 billion. All of this sounds like a lot of hard work, and it’s okay to be nervous as your new business takes its first steps, but stay optimistic. The potential growth of your new business, and the new challenges you’ll face, can also help you grow. Start working for yourself, make your own rules, and build a legacy that lasts. No matter what kind of business you’re starting, these tips can help you get enough money together to get started towards your goals.